A young man emailed me recently offering me four tonnes of insect excrement. I accepted of course. This is what happens when you spend some time in the netherworld of the community garden network. You find generosity and a keenness – or even obsessive compulsion – to share. People force plants, seeds, produce, growing tips, cuttings and insect waste (frass) on you. Gardeners want to share their abundance. And when it seems like there is so little generosity about, that is a joy. In London we’re pretty good at sharing our roads, pavements and green spaces, too. And as private spaces become more and more scarce, community gardens and orchards will be the answer to the squeeze on land – places where we can self-medicate our anxiety and stress with nature. Cordwainers Garden closes on 5 April. The land is owned by the London College of Fashion and the college is moving. We are grateful to them for allowing us to use the land for more than eight years so I don’t blame them for wanting us to go but it’s still sad when we’ve done so much over the years. 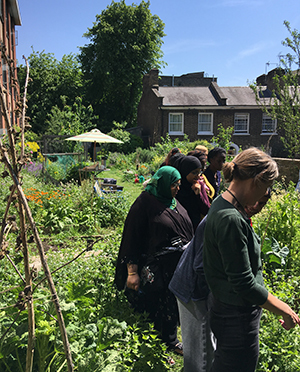 A modern community garden is much more than about growing veg and drinking tea together (though that is important of course). 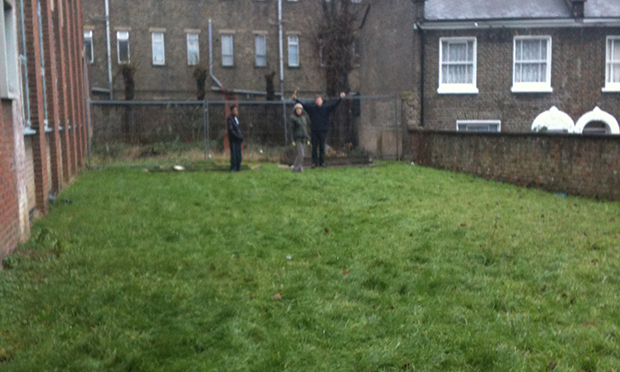 A group of neighbours started Cordwainers Garden in the winter of 2010/11 on a patch of ground which was mostly used by dog ‘walkers’ and drinkers. We always wanted to link what the students were doing inside the building to the outside, so grew plants that could be used for dyeing or making thread. We also developed herb-growing for health and this became Natalie Mady’s amazing Hackney Herbal, which is now a big success. As Nat says: “I wouldn’t be where I was now if I hadn’t joined the garden all those years ago. It helped me to carve out a different future for myself. 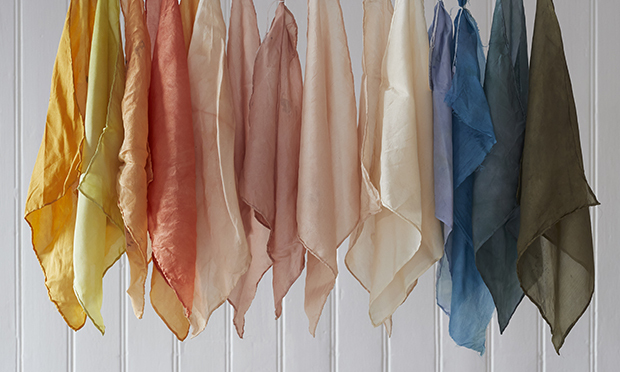 A colour wheel featuring dyes made from plants grown in the garden or from food waste. The Garden supported small allotments, beehives, a ‘slow’ shed made from found materials, dye and herb beds, a pond and countless wild plants, invertebrates, birds and mammals. But gardens are not just places to grow beans; they can grow people. Several of the college’s alumni have gone on to have successful careers involving plants and natural dyeing, including The Dogwood Dyer, which is a successful enterprise that started in the garden and now flourishes in the US. Liz Spencer says: “I feel like my entire professional and artistic path was shifted due to the dye garden. And me? I was working as a journalist doing awful stressful shifts and not sleeping much. I retrained as a teacher thinking that would be what would pay the bills when I took redundancy. I do teach but it is the garden, community and the environment that sustains me. A group of local carers enjoy some respite. That garden changed the course of my life – embedding me in my community so that I meet an astonishing range of people: entomologists, botanists and artists, a man who makes ladders for frogs, spinners of flax with winged shoes, children who popped in years ago to sow a seed or two and later went on to make a film with us, Savile Row tailors and fashion designers, carers who needed time away from their responsibilities, countless students and academics writing about urban agriculture or community engagement, politicians, actors, musicians, activists and even (or especially) inactivists – people who just want to sit and enjoy the peace that the garden provided. We did our first dye workshop using an old door as a table. We have since been invited to Kew Gardens, the Royal Horticultural Society (RHS) and the Chelsea Physic Garden to talk, dye and spin. From that garden we grew, designed and made a linen garment. Out of the garden sprang Cordwainers Grow CIC, which reaches beyond its boundary. Gardens are gentle, safe places where we potter around doing immeasurably positive things like anaesthetising our anxieties, meeting our neighbours, a bit of crafting and informal learning, where biodiversity is encouraged. But they are also places of enterprise, innovation, experimentation and entrepreneurship. There are gardens running comedy evenings, selling pizza, growing for food banks, holding gigs, teaching cookery, making honey, producing edible and decorative flowers for sale, and more. If you’d like to say goodbye to Cordwainers Garden and perhaps pick up a plant, come along on Sunday 31 March from 2.30pm. Enjoy a slice of cake as we dig up the plants we want to save so we can pass them on to other gardens and community groups so that Cordwainers can, as Nat says, live on. If you want to see the amazing variety of insects that can be found in london, have a look at the fantastic book Insectinside. 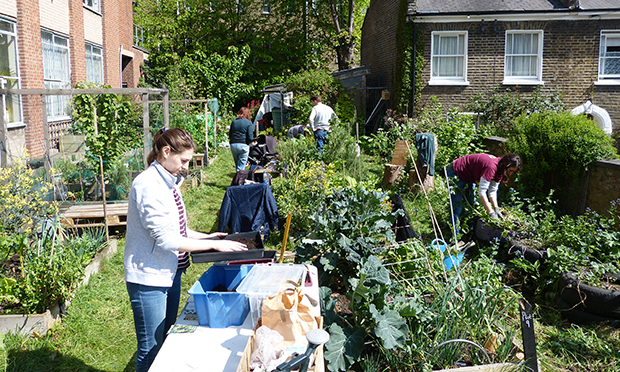 Kate Poland is an award-winning community gardener who runs social enterprise Cordwainers Grow. She was also chosen to be the UK’s first ever postcode gardener in E5 as part of Friends of the Earth’s 10xGreener project.